It’s hard to believe, but Tuesday is the first day of October ! Being Girl Scouts, who are always prepared, prepare yourself for the upcoming month with… Girl Scouting in October. October is National Bullying Prevention Month so talk with the Girl Scouts in your Troop about bullying. What is it that you consider bullying? How does it make you feel? How can you prevent bullying? Bullying prevention could become the topic of a Take Action project. October 1 is the first day that Girl Scouts from Nassau County can sell product for the Mags&Munchies Fall Product Program. Through the Mags&Munchies program, Girl Scouts learn skills such as Decision Making, Money Management and Goal Setting. High School Seniors who intend to complete a Gold Award Project must file their Proposal with Council by October 1. On October 1 through October 4, tell us about what you are looking forward to most this upcoming Girl Scout year. You can tell us on Facebook or Twitter by using the hashtag #ICantWaitTo. Maybe event make a posted showing us what you are looking forward to and post it on Facebook. Are you a new Daisy leader looking for something fun to do with your new Daisies? Join us on October 15 or October 24 at the beautiful Bailey Arboretum for an outdoor fall adventure with GSNC’s Between Earth and Sky program. We’ll talk about skills the girls already have, learn about observation skills as we take a nature hike, and create a nature craft to take home. Remember when the summer was winding down, you were getting ready to head back to school and you couldn’t wait for Girl Scout Troop meetings to start again? What were some of the fun things you were dreaming about doing with Girl Scouts? Was it going to the corn maze like Girl Scout Emma, earning your Gold Award like Girl Scout Katie, or simply being with your Girl Scout Sisters like me? 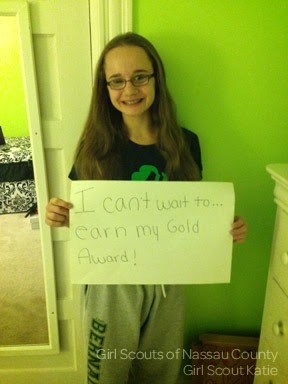 Tell us about what you look forward to most this upcoming Girl Scout year. Tell us on Facebook or Twitter by using the hashtag #ICantWaitTo. You can also share with us a picture, just like Emma and Katie, telling GSNC “I can’t wait to…” and post it to GSNC’s Facebook wall. 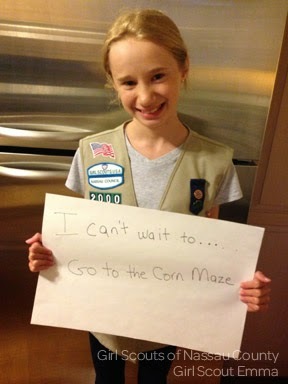 I can’t wait to… hear about all the fun things Girl Scouts are looking forward to this Girl Scout Year! I Can't Wait To: GSNC Dad Vincent's Story! Girl Scout Dad Vincent loves that his daughter (a Girl Scout from Nassau County) learns skills that will prepare her college and the work force while also having fun at Girl Scouting. Hear his story! Do you have a story? Tell us why you love Girl Scouts! Does your vest need something extra to sweeten it up? 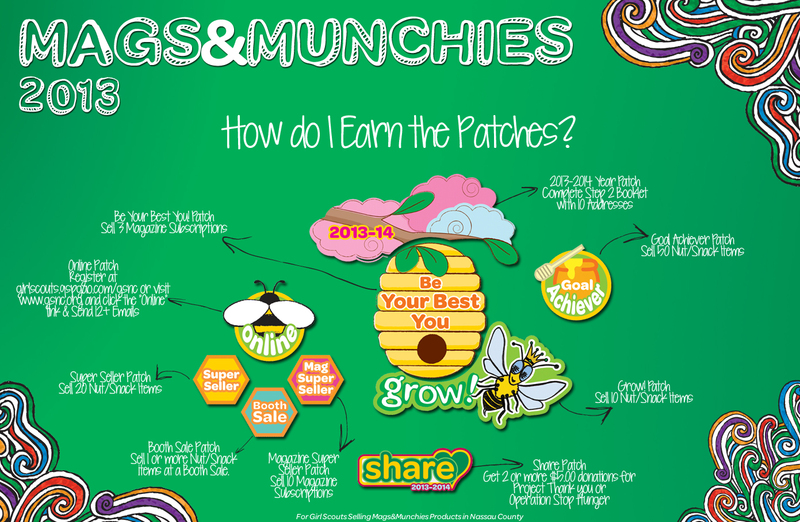 Try earning the interlocking patches from this year’s Mags&Munchies program. You will “bee” the envy of your troop! Set your goal and get buzzing! Booth Sale Patch - Sell 1 or more Nut/Snack items at a Booth Sale. **Please note, "How to Earn the 2013 Mags&Munchies Patches" applies only to the Girl Scouts of Nassau County Mags&Munchies Program 2013. Troop Tips for New Girl Scout Leaders from Seasoned Leaders! My earliest experience with Girl Scout SWAPS was in second grade when my Brownie Troop went Association camping at Camp Blue Bay. I remember seeing older Girl Scouts trading little hand-made pins with other Girl Scouts, almost like trading baseball cards only instead girls would trade hand-made mementos that shared information about themselves. They would share and exchange these gifts with friends and sisters, building a bond with Girl Scouting as the common thread. These pins came in all shape, sizes and colors; in unique and creative designs. I remember wanting to swap as many SWAPS as I could, gathering tons of new Girl Scout friendships. SWAPS (aka "Special Whatchamacallits Affectionately Pinned Somewhere") are small mementos which are handmade and represent the girl, her country, her community, or her background. SWAPS often have a little note or tag attached to them that provides a name, troop number, address or email and sometimes, even a little quote or message… this is so that new friendships and pen pals can be formed with Girl Scouts from other states or countries. Over my years as a Girl Scout, I have seen many creative SWAPS! From butterflies to lollipops, to camp fires and frying pans. SWAPS are all about being creative and sharing your favorite things with Girl Scouts and Girl Guides from all over the world.